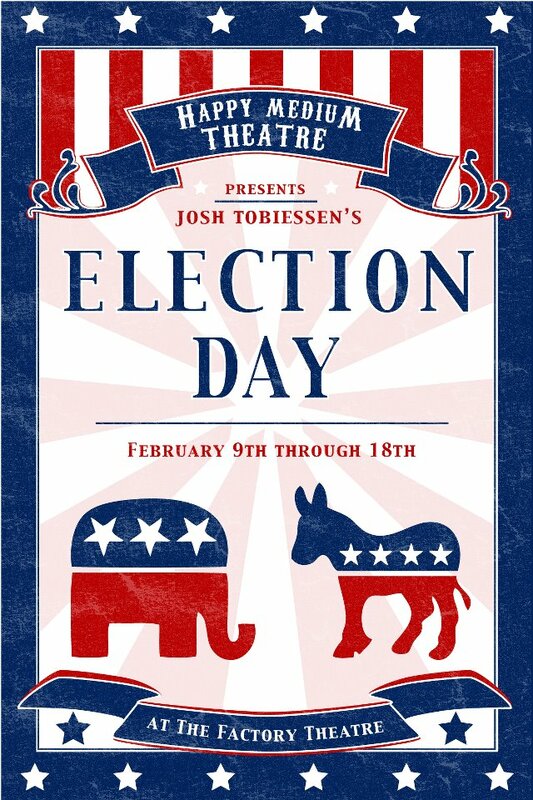 Election Day by Josh Tobiessen, Happy Medium Theatre, The Factory Theatre, 2/9/12-2/18/12, http://www.happymediumtheatre.com/. (Boston, MA) In the tradition of screwball comedies, a relatable everyman is the victim of seemingly normal circumstances that escalate until someone’s handcuffed to a bed and there are Molotov cocktails in the freezer. Well, maybe that’s not most screwball comedies, but the trajectory of Election Day is certainly familiar. The story features slacker goof, Adam (Andy Hicks) as he scrambles to please his uptight, type-A girlfriend, Brenda (E. Abigail Matzeder) in trying to remember to vote in the mayoral election. Adam’s adopted sister, the bubble-headed Cleo (Lesley Anne Moreau), an environmental zealot (Mike Budwey), and a much-too charismatic politician (Sean A. Cote) all end up complicating a day’s fairly straightforward task. With the help of the cast’s excellent comic timing, the light and frothy material gets a few good laughs out of the audience. The plot of the story, though, feels ripped from a weekday night sitcom. This isn’t necessarily a bad thing as hesitant-theatre-goers who manage to find the remotely located Factory Theatre will be in familiar territory. The play knows it’s just for fun. In an election year colored by Occupy X protests and religiously conservative candidates, though, Election Day feels completely divorced from reality. While Cote’s Jerry Clark is an exquisitely slimy, desperate politician, a role that never seems to go out of style, the eco-terrorism plot just feels out-of-touch. It’s not really connected with anything in our current world. It would probably be best enjoyed by people looking for an escape from current events rather than commentary on them. In a play concerning heated politics and undecided votes, though, I imagine commentary is pretty valuable. The more smutty jokes are enjoyable but cannot hide the show’s lack of weight. With that said, the actors are game for the material and manage some good laughs through timing and use of props. Though its impression is slight, for those in the mood for light fare, Election Day is a nice distraction. 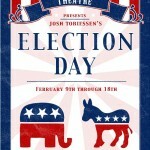 This entry was posted in Comedy and tagged 2012, Andy Hicks, E. Abigail Matzeder, Election Day, escapism, February, Happy Medium Theatre Company, Josh Tobiessen, Lesley Anne Moreau, Sean A. Cote by gilliandaniels. Bookmark the permalink.